Presenting Phir Bhi Yeh Zindagi video song from the movie Dil Dhadakne Do which released this week. The song is a slow track in the voices of Farhan Akhtar, Vishal Dadlani, Divya Kumar, Alyssa Mendonsa and Sapna Pathak. It is composed by Shankar-Ehsaan-Loy and the lyrics are penned down by Javed Akhtar. 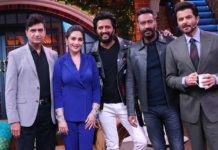 The video shows Ranveer Singh, Priynka Chopra, Farhan Akhtar and Anil Kapoor going through the problems and tensions in a typical family. Dil Dhadakne Do is directed by Zoya Akhtar and produced by Ritesh Sidhwani & Farhan Akhtar and is presented under the banner of Excel Entertainment, Jungleee Pictures & Mirchi Movies Limited. The film features an ensemble cast of Anil Kapoor as Kamal Mehra, Shefali Shah as Neelam Mehra, Priyanka Chopra as Ayesha Mehra, Ranveer Singh as Kabir Mehra, Anushka Sharma as Farah Ali and Farhan Akhtar as Sunny Gill.